A 4-post table that adjusts easily, from front or rear, for a comfortable work angle. 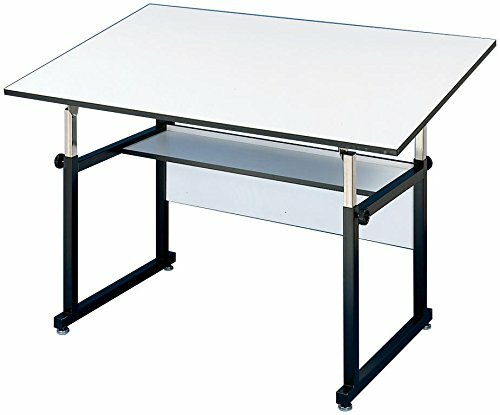 Versatile and attractive, the WorkMaster can be used as a reference/layout table, computer workstation, or drafting table. Ideal for architects. Counter-balance not required when using drafting machine. Angle adjusts from horizontal (0) to 40. Height adjusts from 29 inches to 46 inches in horizontal position. Base of 1 1/2 inches x 1 1/2 inches heavy-gauge steel tubing, black. 12 inches x 42 inches storage shelf with modesty panel. Warp-free white Melamine tabletop 116 lbs.